i don't have one, but they look pretty cool and versatile too. I'll keep my eye on the thread to see what people tell you. I think the Snuglid SL is the best lookin one so far. Check out the Advance folding cover also, I've posted a review here previously if you're interested. I looked at the fold-a-cover also, but couldn't get as much info from their site as I wanted. That's pretty much the same as the one kcovers.com sells (or maybe it's the same?). I just bought one and it should be here Monday or Tuesday. Of course, now I need a truck to install it on! Should be another 4 or 5 weeks for the truck. I like this cover because it's easy to remove quickly if you're out and about somewhere and didn't realize you'd need to remove it before you left home. I wanted to be able to remove teh cover and store it in the bed along with the cargo if I ever need to do that in a pinch. I won't get one of the hard fiberglass covers because it's too much of a hassle to remove if you need to use your truck as a truck. I think the Snuglid SL is the best lookin one so far. I like the look of the Snuglid, however, I have to agree with lariatf150. I want to be able to take it off in a couple of minutes without to much hassle. Snuglid, you can't take it with you if you do. ddinsmore, I will check your previous post, thanx. Theres pics in my gallery. Trucker1154 can you tell me how well does your Torza cover lay down on the Box top rails? Does it flare out at the hinge points? I have the Fold-A-Cover. I've had it for about 8 months and so far so good. Take your time installing it to prevent leaks. If you do it right, it's waterproof even in storms. I love the looks and the versatility. To remove it you just back off 4 allen screws and lift it off while folded up. The Advance cover is different then the fold-a-cover. I looked at both. The major difference being the way it seals. The Fold-a-cover uses AL rails that grab into the stake pockets and the cover rides on those. With the advance cover you lay rubber seals directly down on the bed rail and it seals against those (you can still use the stake pockets). I think the advance cover has better metal locking hardware inluding a latch to the middle sections where the fold-a-cover only latches on the front and back panels. I looked at all the covers myself. Fiberglass prevented me from hauling large items or hanging with people in the bed....retrax has that irritating canister and prevents you from being able to strap loads to the front wall of the box....I needed something hard and locking for my DJ equipment and powertools....So all of those factors lead me to the Fold-A-Cover. Let me know if you have any further questions! Did you sell your saleen to a kid in CT by the name of Matt??? I have a fold-a-cover on my truck. 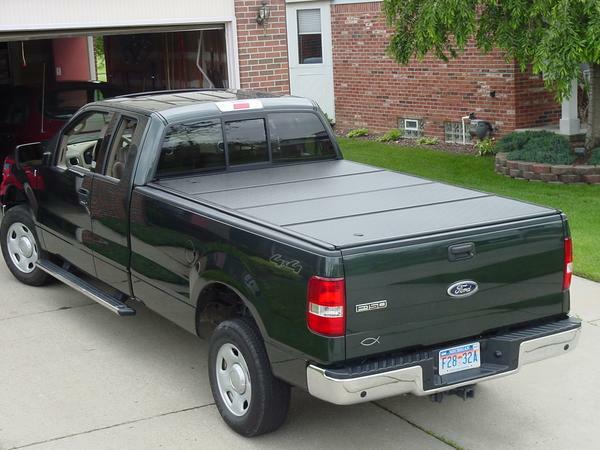 I like it WAY more than the soft tonneau covers I've had on my other trucks due to the way it folds open and doesn't require 10-billion snaps to stay tight. My only grievance is the cheap-o plastic latches and latch system they use. They do the job and all, but I'd prefer to have a more positive connection between the top and the side rails. I've only had it for a few months, so I can't comment on long term durability, but I'd recommend it based on ease of use and functionality. I've had a fold-a-cover and my buddy currently has one. Great at first, blows huge chunks after a few years. They fall apart. Mine did, and his is starting to do the same. If you keeping your truck for the long haul run away from the fold-a-crapper! What was the cost on the cover? Yes the Retrax takes up 11 inches but sofar it has not been a problem. You still have all the space underneath the canister. I think it seals better and to remove it takes 2 minutes. 4 bolts with a 9/16th socket and you lift the whole cover off - rails and all. The Fold-a-Cover on my F350 worked well. Takes a lot of patience to install correctly. I am sure it is very durable in the long run but don't close it on something that is a little bit high because it will pierce the cover. Been there and done it! To remove it is a bit more involved - 4 hex bolts in an akward position and then the rails are still left behind and the 2 bracket that the cover is attached to still protrudes into the box. If you open it from the back and fold it up you are still 12inches I would guess in the case of the Supercrew from the cab. On the F350 the panels were 22 inches wide. I hope this helps some and remember it is only my opinion!